The use of modeling tools for creating conceptual data model based on previous requirements analysis. Discovering data entities and data attributes in requirements. Identification of data entities with use of single and compound primary key. Discovering relations between data entities. 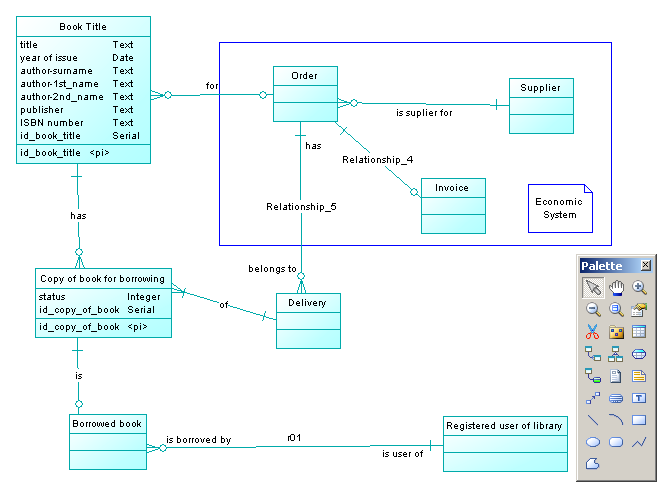 Drawing conceptual ERD (Entity Relationship Diagram). A good data model is a good basis for the design and implementation of the system, which not only meet current requirements , but will be well modifiable at the stage of using the system according to the new requirements. The source for the compilation of the data model are user requirements. Nouns in the text formulation requirements are potential data entities, attributes of the data entity or external entity ( terminator, actor). Data attribute (abbreviated attribute) is named type with defined domain of values ​​ and with clear meaning ( semantics ). E.g. attribute called "book title" ( title) is a character string with maximum length 30 characters , which is used to store the title of the book. Attribute "year of issue" is a positive integer - year of publication. Data entity is a set of interrelated data attributes allowing to describe the essential characteristics of object, which is used for processing, input or output of business processes. An example of a data entity is an entity called " book " as attributes name, year of publication, etc. Nouns in user requirements may constitute not only data entities and attributes, but also users of the system (terminators, actors). Actors are objects or subjects with which the system communicates somehow. Some types of actors can be represented by data entities - those are the actors , about which the system should register some information. In the case of the library UnivLib example of such an actor is a registered user, which represents and data entity. To build the data model is necessary to analyze requirements and to discover data entities, their attributes and relationships between data entities (relations). Analysis of user requirements and discovering data entities. Document view of requirements is source for this analysis in UnivLib Project. 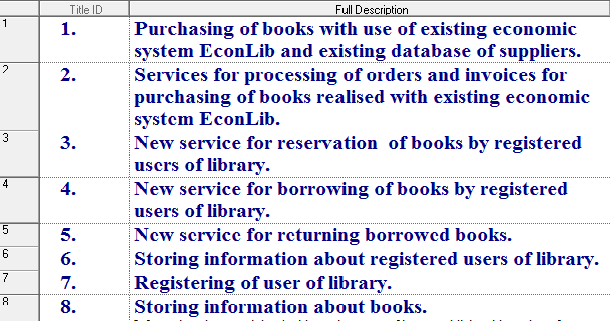 Discovered data entities: book, order, invoice, registered user of library. Task: Make analyze of user requirements for Your semestral project - discover data entities in list of requirements. Use previous examples from UnivLib project. Analysis of user requirements and discovering attributes of data entities. Detailed description of requirements are sources for this analysis in UnivLib Project. Task: Make analyze of user requirements for Your semestral project and discover attributes of data entities. Analysis of data entities and discovering key atributes of data entities. Finding attributes, which can be used for identification of each occurence of data entity in UnivLib Project. Task: Make analyze of data entities for Your semestral project and discover key attributes of data entities. Analysis of discovered data entities and their roles in analyzed system and discovering relations between data entities. Discover suitable name for each relation in UnivLib project. Task: Make analyze of data entities in Your semestral project and discover relations. Drawing first iteration of conceptual data model based on entity relationship diagram. Use names for relations and roles and define cardinality for quantification of occurence of each instance of data entity in each relation. Task: Make analyze of data entities in Your semestral project and discover relations and their cardinalities. PowerDesigner v12.5 Business Process Model. On-line Help System. Task: Add attributes and keys to all entities in the ERD for example UnivLib project. Task: Draw ERD for all data entities in Your semestral project. Task: Make presentation of initial requirement model and business process model of Your semestral project. Task: Prepare presentation of conceptual data model of Your semestral project for next laboratory work Lab05.